ONE is a campaigning and advocacy organization of nearly eight million people around the world taking action to end extreme poverty and preventable disease, particularly in Africa. Today, on International Women’s Day, ONE is asking for the public to get involved in impacting the 130 million girls who did not attend school today. 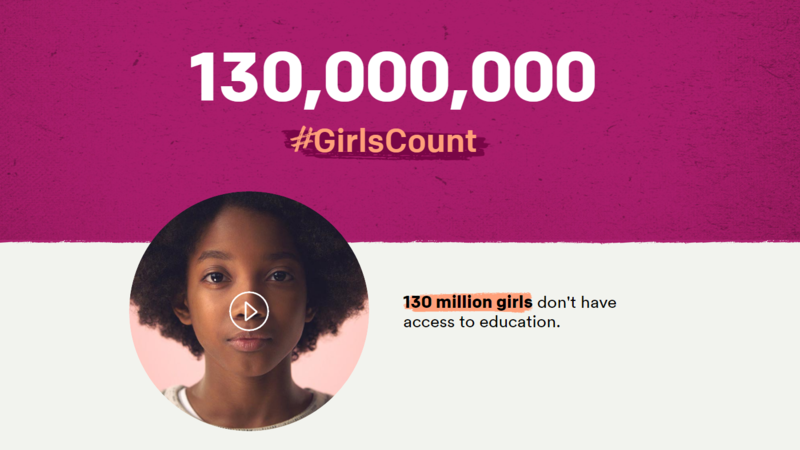 To emphasize that these girls count, people can use the hashtag #GirlsCount on social media and participate in a project creating short videos. Individuals are to choose a number between one and 130 million and film themselves counting the number, or add a photo of themselves with the number. Together these short videos will become possibly the worlds longest film, and will be delivered to leaders to show them the importance of acting in the benefit of these 130 million girls. Click here to add your voice to this project and work towards educating and empowering young women and girls.